The Samarind RMS suite is a fully integrated software solution that has been purpose built to mirror the processes associated with acquiring and maintaining product licenses. Samarind RMS provides a smarter way to manage your Medical Product Information. Using Samarind RMS, you only need to enter data once and can reuse it as many times as required. For example an ‘INN’ can be entered once and reused for all related IMA submissions, renewals, variations, PSURs and XEVMPD submissions. This concept applies to all key data held within the system and is proven to streamline workflows and help to increase data quality. Our pragmatic approach to systems design and implementation means that our customers can manage their licenses smoothly and efficiently, safe in the knowledge that our single-place-of-truth™ approach for regulatory affairs professionals delivers a complete end-to-end system. The core of Samarind RMS is its regulatory information management database. This has been carefully structured to allow you to accurately record and maintain all your medicinal product information throughout its lifecycle. The Samarind RMS Windows software application provides the security, flexibility and ease of use that your regulatory affairs team needs to meet its regulatory and commercial obligations. Extremely flexible and user friendly search and reporting facilities. The Samarind RMS Medical Device Solution offers one of the most efficient and practical ways to manage all of your device registration information in one place. Our proven, intuitive software has been designed to help our customers more easily manage their licenses with complete confidence. The Samarind RMS solution is well known in the marketplace as a high quality, sophisticated, user-friendly and well-architected application. Our solutions are in use every day by customers around the world and are supported by a level of customer service that is setting a new benchmark for client satisfaction within the life sciences. The Samarind RMS Solution leads the way on XEVMPD data management and processing as well as providing full support for the FDA’s UDI standard. Our unique database structure means that the transition to IDMP will be just that – a smooth transition. Instem has been supplying world-leading solutions to the life science community for more than 30 years and is well versed in all aspects of regulatory data capture, reporting and management in support of the industry’s processes. As a stable publicly traded corporation, Instem’s trusted services and solutions are supporting drug developers, medical device organizations, contract laboratories, consultants, universities, government agencies and leading health institutes in their missions. Once clients become proficient users, Instem becomes an extension of their business ensuring they receive the highest amount of value from our integrated software. Through our Relationship Managers and value-added support tools, clients have access to a wealth of resources and support so they stay focused on their science, not their software. Our solutions work independently or together, all designed to help clients bring their life enhancing products to market faster. 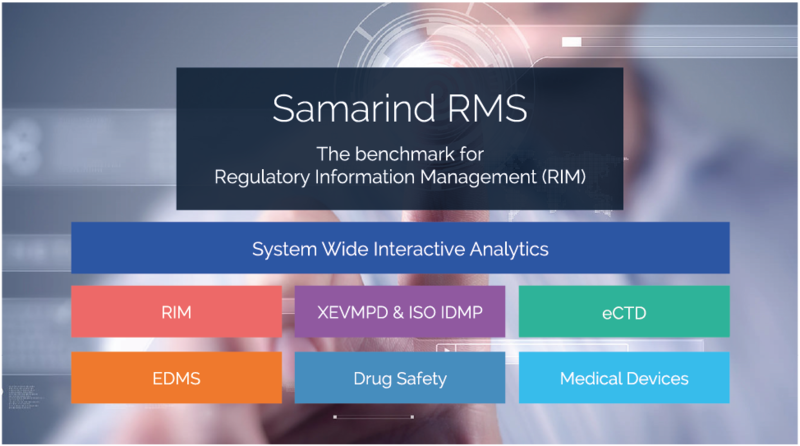 The Samarind RMS Drug Safety Solution offers one of the most efficient and practical ways to manage all business-critical pharmacovigilance activities from within a single environment. Today’s Regulatory Affairs Specialists are now accessing, processing and analyzing all of their regulatory data in one place, with complete confidence. Our pragmatic approach to systems design and implementation means that our customers can manage their information smoothly and efficiently, safe in the knowledge that our single-place-of-truth™ approach for regulatory affairs professionals delivers a complete end-to-end system.